Surviving in the corporate world is not easy. Anyone who is a part of the business world today will tell you that things might not always go your way and failure is something which you must learn to deal with at times. Many young people believe that failure is something to be ashamed of, yet this is not so. Failure is nothing but a stepping stone towards success. Bridging skills gap in your team might not be an easy task, given the fact that this is a very controversial topic indeed. It is rather unfortunate to note that though several top companies are waiting to employ new workers on-board, they are simply unable to do so, owing to the fact that there is such a skill gap which exists. Companies spend long duration of time in trying to recruit the perfect employees but nowadays they find that the employees, no matter how educated they are, are unable to provide what companies are looking for. Most companies have very specific criteria which they are looking to fulfill and when the potential employees fail to deliver, the recruiters have no choice but to continue to search for someone better and more suited for the position. The skills gap is present and wide. Broadly speaking skills gap is the gap that exists between the skills, which employers are looking for in their employees and the skills which the employees actually have. Due to various reasons the workplace skills gap has just increased over time and has made it very tough for people to find good jobs. Job satisfaction is something which is very important indeed. If employees are not content with what they do, they will never be able to give up top quality work. Most individuals have various degrees but are lacking in skills which are needed to do the job well. This is indeed a controversial issue which leads to and is the cause of a number of problems. Due to such a skills gap, problems are not merely faced by employees but they are also faced by employers. Firstly employees are forced to either remain unemployed or secondly they are forced to ‘settle’ for a job which is not at par with the qualifications which they have. As opposed to this, employers are unable to fill in key positions in their company no matter how hard they try. A company must function as a well oiled machine, but if key positions are not filled, things are sure to go out of hand. Skills gap is an issue which is not related to one company or country alone. On the contrary it is a problem which is faced across the globe. Such a skills gap threatens to shake the very foundation of the business world itself. If this issue is not taken care of or proper skills gap analysis is not done, the gap will only keep growing wider and wider. The wider the gap becomes, the more difficult it will be to find solutions to the problems. Each company should try their level best to try and bridge the gap so that things can function in an effective manner. There are many reasons for such a skills gap, one of the most important reasons for it is owing to the lack of skilled and trained professionals in two key fields. The first is that there is a shortage of individuals who have sound technical and scientific knowledge and second is that there is a lack of individuals who have soft skills. Rather than taking too many people on-board, companies are on the lookout for individuals who are the complete package. It is needless to say that our present educational system is greatly flawed. It is rather unfortunate, that the syllabus is so huge that teachers are forced to race against time and try to complete the curriculum, rather than giving the students time, to let the knowledge sink in and be truly understood. It is advisable that the syllabus should be reduced and that the system of education should not be so exam oriented. Professors should try their best to encourage students to think beyond the box and not only go by the book at all times. So before doing anything else, the first step towards bridging the skills gap is by recognizing the flaws in the education system. There are a number of reasons for such a skills gap which exists, but the root of the problem lies in the fact that the education system is very traditional and has not been adapted for a number of years. Many of the things which are being taught today are obsolete and can be done away with. No matter how badly a good teacher might want to change his or her style of teaching and adapt it to suit more modern needs, the syllabus, simply does not permit this. In many places the syllabus has not been updated for more than 10 years. In the last 10 years so much has changed in the business worlds and so many career lines which did not even exist then are simply flourishing now. One of the most effective ways to bridge the skills gaps between work and education is by stressing on practical education as well. It is a well known fact that education today simply focuses on theoretical knowledge. Though theoretical knowledge is important and cannot be done away with, students should not be encouraged to only have theoretical knowledge. Nowadays companies are on the lookout for individuals who have the ability to come up with practically and simple solutions to problems without much difficulty. If colleges and business schools put so much focus on theory, the students will be unable to think on their feet. Of all the skills which employers are on the lookout for today, one of the most vital skills is the skill to communicate well. Many smart students who have so much knowledge in the field are unable to get their ideas across in a proper and successful manner. This is owing to the fact that they are only used to writing things down during an examination and are unable to speak and hold a proper conversation. So bridge the skills gap between work and education, the colleges should encourage students to come forward and participate in debates and put up presentations. Most companies today are looking out for workers who have at least some experience. Even new comers are expected to have some experience in the form of internships which they were a part of. It is vital that colleges or business schools encourage students to take up internships so that they can get a taste of what it is like to be a part of the actual business world. Even a single internship at a good company, really gives freshers an edge over the other candidates who are applying for the same post. Most often, interns are not paid a salary, but in the course of their internship they do receive a lot of knowledge and exposure. One of the main reasons why the skills gap has become so wide is because there is so little interaction between companies and business schools. Those imparting the education are unaware of what the companies are looking for and are therefore unable to prepare the students accordingly. Because of this communication gap it is the students who end up suffering the most. Bridging the gap will only be possible when both the systems are more transparent and the companies voice exactly what skills they are looking for in the employees which they are looking to employ. Different companies look for different skills in their employees. The first step in order to bridge the skill gaps in the workplace is by actually recognizing the gap which exists by gap analysis process. To do this the seniors in the company must ask themselves some important questions. The first question is what exactly are the skills we are looking for? And second what are the skills which the potential employees are offering? And third Is there a possibility for some meeting ground in the middle? If companies fail to acknowledge, that such a problem exists and are unwilling to work towards it, then things will never improve. 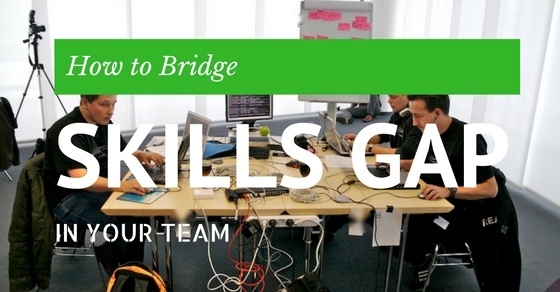 There can be no quick fix to bridging the skill gap which exists in the company. The seniors in a company must be willing to invest both time as well as money in order to ensure that the gap becomes less wide. A proper gap analysis should be done by the company. Rather than trying to solve the problem in one day, they must steadily work hard to ensure that things improve over time. To ensure that the skills gap decreases in size, the companies should conduct training programs. Such training, when given to workers, helps them to work better and in a more efficient manner. Though organizing such training may not be very cheap, but it does yield rich dividends in the future and it helps the employees understand exactly what is expected of them. If the company is unwilling to make a little effort on their own part they will never be able to find employees who are suited to their needs exactly. Rather than organizing training programs and workshops for simply the new comers. Companies should try and organize training for all the employees irrespective of how many years they have been working there or what post it is that they hold. Having such training programs on a regular basis really keeps the employees focused and properly functional. Finally, simply conducting training programs is not all that you need to do in order to lessen the gap which exists. It is very important that companies after implanting these strategies actually gauge whether they have been effective or not. Rather than trying to put into practice any and every strategy which they can in order to get the company to function properly, they should put into practice only those things which they feel would really help their company. Even a few steps goes a long way in ensuring that this gap does decrease. Skills gap in the workplace is a problem which exists, but it is certainly not impossible to get rid of it. Bridging the skills gaps in a team is not going to be easy, given the fact that various individuals differ in their understanding and explanation of what leads to such a skills gap. No matter what individuals say, there is no one cause or one solution for such a skills gap. It is of paramount importance that both employers as well as employees try and adapt their wants and needs in a particular way. If this is not done, then unemployment is going to become a bigger problem among professionals and offices are going to continue to find it hard to fill in various key positions in their companies. Next articleHow to Write a Retirement Letter to Coworkers?